While that may not be technically accurate – because there is no problem related to economics that can’t be solved if one is willing to swallow sufficiently strong medicine – it is a correct assessment, given the overwhelming role that politics now play in the economy. In a recent edition of The Casey Report, I observed that the largest and most persistent bubble of all over the last half-century has been the bubble in government – making the ones witnessed in dot-com stocks and housing mere blips by comparison. The following chart is particularly illustrative of that contention. 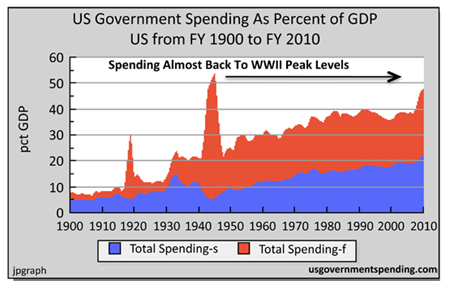 the level of government spending (state being the blue area, and federal being the red) as a percentage of GDP has grown to levels last seen during the unprecedented mobilization undertaken to fight WWII – a period marked by the government takeover of entire industries, rationing of all key commodities, wage and price controls, and much more. Though it is an overused analogy, the chart paints a perfect picture of a frog in a pot of water slowly being brought to a boil. The economic trap the government has stumbled into opened decades ago, as a result of the nation’s leaders misunderstanding both the basics of economics and the complex relationship between the rulers and the ruled. To frame the discussion, I would start by pointing out that in order for a government to be successful, above everything else it needs to avoid being hated. That’s not to say that it has to be wildly popular, though that’s never a bad thing, just not actively despised. Generally speaking, the single most important way that a government avoids becoming the object of public hate is to maintain things in such a way that people are able to get by financially. Sure, people might not like a politician’s ethics, and they might have strong views about some stupid and destructive government act, but if people can get up every morning secure in the knowledge that there will be food on the table and a roof over their heads – that their businesses will carry on in a more or less predictable manner – their opinion about the government will never rise to the level of hate. Which brings us to the trap the U.S. government stepped into, as did virtually all of its peers around the globe. Decades ago, the government simply decided to expand its role beyond providing the basic services that make some contribution to a smoothly operating society. While it may have done so with the best of intentions, the record makes it clear that its motivations have increasingly been political in nature. Returning to the chart, you can see that in the early part of the 20th century there was almost no growth in government. You can also see that that period of quietude was sharply disrupted by WWI, then the Great Depression, which was followed by WWII – each of which jacked the government’s role in the economy markedly higher. And once the trend got started, it has largely continued unabated until today. Note the latest spike, at the far-right side of the chart, and you don’t need to wonder where things are headed next. The government could have avoided stepping into this trap simply by resisting all calls for it to expand the limits of its role in order to “do something” about this societal ill or aspiration – rigorously leaving such matters to the people themselves to address. While successive generations might have groused about the government being uncaring or unsympathetic to the needs of the needy, by being tight-fisted and modest in its exertions, the government’s finances would have remained solid as a rock. That in turn would keep the weight of the government’s dead hand on the economy light and readily manageable. As a consequence, come what might, the vast majority of people could count on being able to earn a good dollar and keep most of it for their own purposes. In other words, if back in 1905 or so, the government had just said “no” to foreign adventures and domestic largess, we would today be living in a different world altogether. Let me get to the point, because it has important implications for us all. If the government had kept its role limited and its finances in good shape, people might not love it, but they’d respect it – and, more to the point, they wouldn’t hate it. However, by expanding as it has, the government has drained its treasury. Then, politically unable and unwilling to stop its spending, it kept going – racking up the largest debt in history. That has brought us to a crossroads. One path leads to more spending, in which case the currency will collapse, wiping out the remaining wealth of the citizenry… resulting in a hateful population. The other leads to overt default and a wholesale unwinding of the government’s massive role in the economy, again wiping out the wealth of the citizenry and resulting in a hateful population. In either scenario, a government anxious to avoid the worst can be expected to raise taxes and take other desperate measures to avoid failure. Hungary, Poland, Bulgaria, and other nations have recently made pension grabs; we can expect to see that in the U.S. as well before this is over. Again, at the same time that these moves may help the government stay afloat awhile longer, it plants the seeds of public hatred and cements its eventual downfall. In our strongly held view, the government will continue to opt for the path of more spending – until it simply can’t, at which point the first path will lead back to the second. And so, no matter what it does at this point, the government will soon find itself faced with serious and widespread discontent. Throw a heavily militarized constabulary into the mix, and the potential arises for the situation to get very ugly, very fast. That the government remains firmly committed to its spending becomes obvious in a recent Reuters article about plans by the new Republican House to reduce Obama’s already diluted $100 million in planned federal budget cuts, to just $50 million. And this while the government continues deficit spending to the tune of more than $100 billion a month. What a joke. What a bad, bad joke. In the current edition of The Casey Report, senior editors Doug Casey, Bud Conrad, and Terry Coxon chart the frothy economic waters we are finding ourselves in – and provide practical advice how to navigate them to your benefit. You have to make your own decision as to how you’ll protect yourself about what’s coming, whether by just diversifying into inflation hedges, or diversifying your life internationally – but whatever you do, don’t be lulled into complacency by any temporary pick-up in economic activity engendered by the government’s monetization. It’s a trap. [Right now, you can get The Casey Report for only $98 per year – an unprecedented 72% off the regular price. But hurry, this special offer is only available for 72 hours. Details here. The Casey Research web site, Casey’s Investment Alert, Casey’s International Speculator, BIG GOLD, Casey’s Energy Confidential, Casey’s Energy Report, Casey’s Energy Opportunities, The Casey Report, Casey’s Extraordinary Technology, Conversations With Casey, Casey’s Daily Dispatch and Ed Steer’s Gold & Silver Daily are published by Casey Research, LLC. Information contained in such publications is obtained from sources believed to be reliable, but its accuracy cannot be guaranteed. The information contained in such publications is not intended to constitute individual investment advice and is not designed to meet your personal financial situation. The opinions expressed in such publications are those of the publisher and are subject to change without notice. The information in such publications may become outdated and there is no obligation to update any such information. Doug Casey, Casey Research, LLC, Casey Early Opportunity Resource Fund, LLC and other entities in which he has an interest, employees, officers, family, and associates may from time to time have positions in the securities or commodities covered in these publications or web site. Corporate policies are in effect that attempt to avoid potential conflicts of interest and resolve conflicts of interest that do arise in a timely fashion.